The Marion County Health Department says they received a complaint Tuesday about excessive fruit flies and house flies at the McDonald's restaurant at the intersection of 16th and Meridian streets. The restaurant was shut down Wednesday afternoon and the health department ordered them to hire an exterminator to take care of the excessive fly issue. INDIANAPOLIS -- An Indianapolis McDonald's restaurant that was closed by the health department because of a pest issue was reopened Wednesday evening. The Marion County Health Department says they received a complaint Tuesday about excessive fruit flies and house flies at the McDonald's restaurant at the intersection of 16th and Meridian streets. The restaurant was shut down Wednesday afternoon and the health department ordered them to hire an exterminator to take care of the excessive fly issue. "Drink spills are attractive to fruit flies. Cleaning conditions, obnoxious odors, may attract fruit flies. Those are things that attract them and cause them to breed in the restaurants themselves," said Derek Trackwell with the Marion County Health Department. According to online inspection records, the health department inspected the McDonald's on July 11, finding "several house flies present in dining room area," and "a few house flies and several gnats present in kitchen area." The restaurant was inspected again after somebody complained that there were "live bugs" in the cup of orange juice they were served. The inspections on July 20 and July 26 found gnats in the "drive-thru coffee area." Those complaints did not result in a shutdown. The health department allowed the business to stay open and clean up the areas. Investigators say there was an excessive amount of fruit flies this time around and action had to be taken immediately. 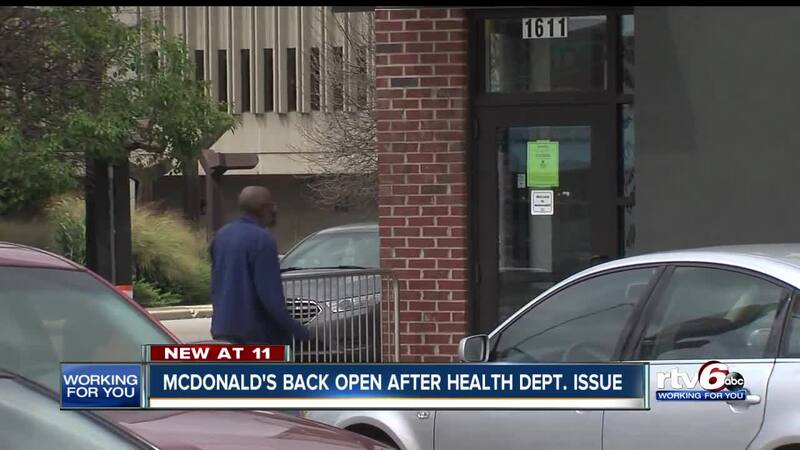 The McDonald's location reopened sometime Wednesday evening, although the health department has not yet returned responded to requests on whether or not they have passed their latest inspection. 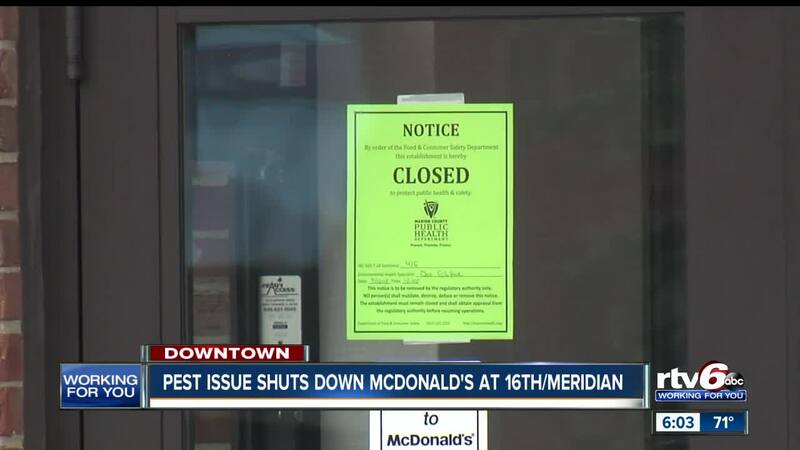 That particular McDonald's started locking its doors overnight after an RTV6 report in January. In the first 22 days of 2018, there were 57 police runs to the McDonald's, for things like fights, disorderly conduct, destruction of property and drug overdoses.